Folding multi-angle cane ensures you’ll always have support on hand. 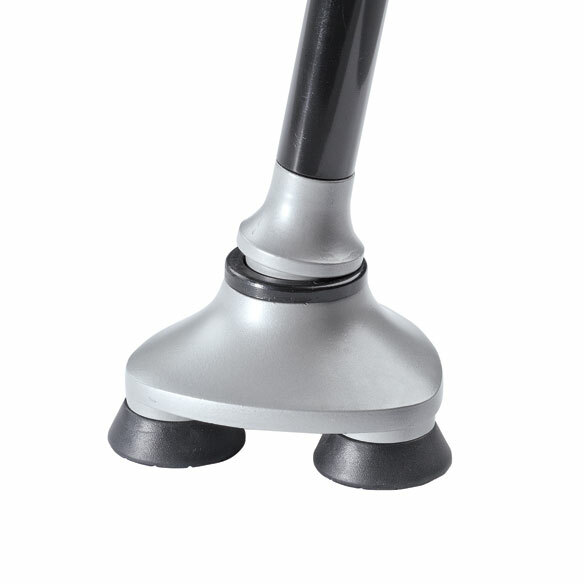 This walking cane instantly and easily unfolds for help maneuvering over any surface, even rough terrain. Pivoting, multi-angle base allows a more natural walking gait. Comfort-grip handle and wrist strap. 5 height adjustments range from 31¼”–36”. Collapsible cane folds in thirds for easy storage and transport. Triangular base measures 3¼” on each side. Durable plastic and aluminum cane. This is 1/3 the price of my other tripod like cane and it folds! 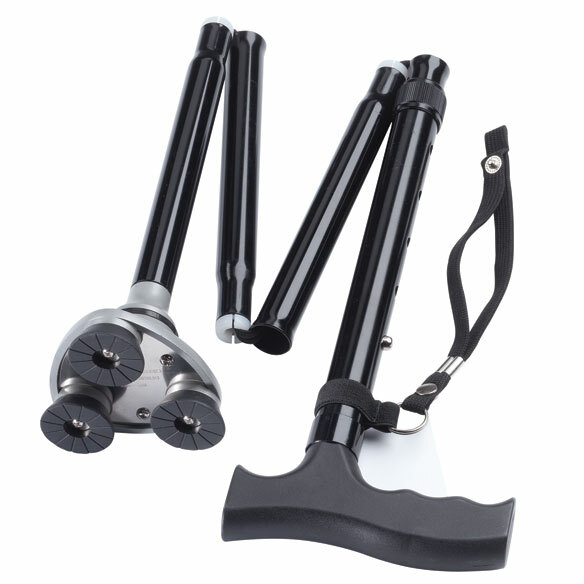 Heavy duty but not heavy, the tripod like foot is sturdy and flexes just enough as you walk. I always drop my canes when I need both hands but this free stands and it has a strap. Best cane I have. (I have about 20!) This is nice looking, and looks expensive. I have a bad back, bad knees (one just replaced) and poor balance, often use 2 canes. This is a life saver. I have a cane that I leave in my car. But many times I get somewhere that I have to stand for long periods of time. This fold out cane is there in my purse so that I can use it for added support for my back pain. This product will help to get you where you want to go! very sturdy, also adjustable to my height. It is easy to take with me wherever I go and can be folded to make it easier to carry with me if i go somewhere..
Mostly for balance when walking! A Great Product at a Great Price! Bought as a Christmas present and the recipient Loves It!!! Having to deal with bad knees and balancing this makes her able to get around much easier plus she can keep it in her purse when traveling. Just Love this cane its sturdier than the regular canes. Feel more at ease using it for support. Compact for travel; as a spare on trips, in case a cane gets lost; easy to open up, and easy to disassemble after use. Although the cane stands alone it takes a minute to get it steady. Use it for walking assistance when shopping or walking longer distances. Catalog information on weight limit did not match information that came with product I.e. Catalog said weight limit is 350 lbs; however, product info states 250 lb limit. Doesn't not stand upright as stated, falls over on carpeting Etc. Doesn't fold that easily, there are elastic cords that run down the inside of the cane and you have to pull the cane apart to fold it. 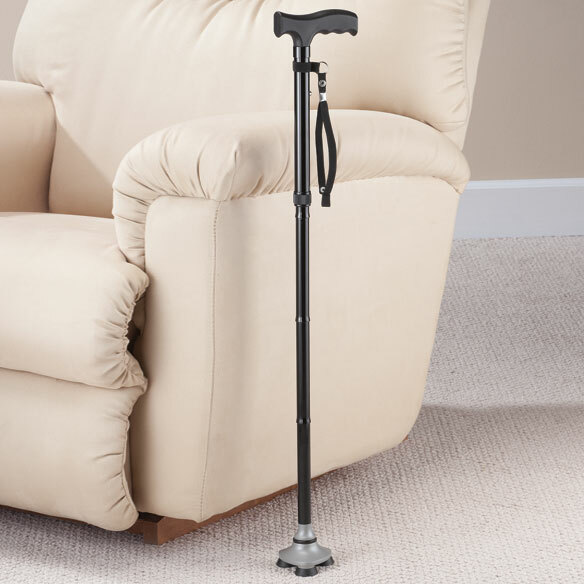 I chose this walking cane for my mother to assist her with walking and balance. Only need a cane part time, this I can fold up and keep with me. It looked kinda neat, I need one I'll dry one out. This is a replacement, had one left it somewhere. He likes it because he folds it and puts it in briefcase. It suits to my desire and the price is reasonable. replacement for the one I have now. I got this to go with other one I ordered for my Dad so heasy has a couple of options. He needs new canes to go with his older ones. Senior citizen needs more stability, less weight! Helps me walk better due to neuropathy in left leg. Have been looking for a lightweight good looking cane that I could carry in a shopping bag in case I needed it. Because it folds it should be ideal! i love the style,and i love that it folds. For mom to have more support. Looks easy and convenient to take with me. I need it for support. I chose this one for the base and size adjustment features. The canes I now use fall when I set them up against a wall or chair. This one will stand on ti's own. it look easy to use it is for my mother and wanted the best for her. BEST ANSWER: Thank you for your question. We do not sell our products in stores, catalog or online only. We hope this information will be of help to you. Can I purchase replacement tips for this cane? BEST ANSWER: Thank you for your question. Unfortunately we do not carry the replacement tips. We hope this information will be of help to you.